St Louis Glass was Founded in 1586 and is One of Europe’s Oldest and Most Esteemed Cristalleries. In 1938, this Beautiful Crystal Collection of Glasses by Saint Louis Crystal received the Highest of Praises at a Lavish Luncheon Held in the Hall of Mirrors at The Palace of Versailles, Honoring King George VI. 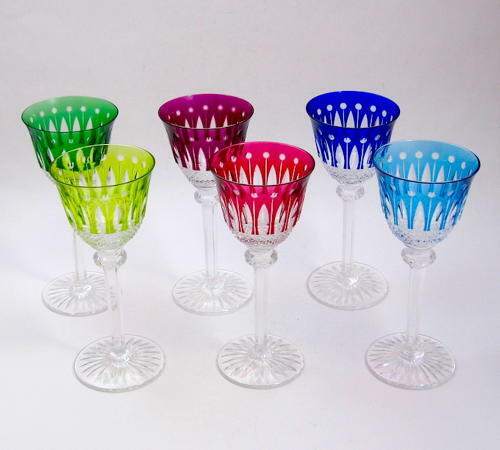 Eleven of the Crystal “Tommy” glasses were placed in Front of Each of the Two Hundred Guests, Including Both King George VI and Queen Elizabeth. This Luxurious “Tommy” Crystal Glass Set Offers a Palette of Six Vibrant Colours that Celebrate Saint Louis’s Mastery of Various Crystal Cuts including Diamond, Pearl, Olive, and Star Cut.